Located twenty minutes from Lisbon on a spectacular, four-hundred-acre coastal estate, Oitavos does well to put the spotlight on its greatest asset: the setting. The sleek minimalist interiors, adorned with little more than clean-lined furniture and the occasional piece of modern art, are all about drawing the outside in. Not that window-gazing is the only activity on offer. Though it’s all surprisingly well integrated into the landscape, the 142-room hotel is home to a resort-length roster of amenities: a world-class golf course, a 230-stall equestrian center, a pair of gorgeous seawater pools, a full-service spa, business and conference facilities. The list goes on. The rooms, all with ample windows, start out big and only get bigger. The baseline superior rooms start at six-hundred square feet, with views of the golf course from inside and glimpses of the Atlantic from the balcony. Premium rooms offer essentially the same space and open-plan layout, only here the windows look right out onto the ocean. By the time you get to the Oitavos suite, with its sweeping vistas over both the coast and the golf course, the balcony alone is about twice the size of your average Manhattan hotel room. Kindly note that The Oitavos is seasonally closed from mid-December until mid-January. 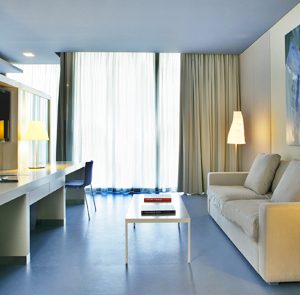 How to get there: The Oitavos is 35 minutes away from Lisbon International Airport. Please contact CustomerService@TabletHotels.com for more information or assistance with transfers.